EVENT: FUNK, SOUL, JAZZ, BOOGIE – Struttin’ Fridays at Tonka Bar FEAT. 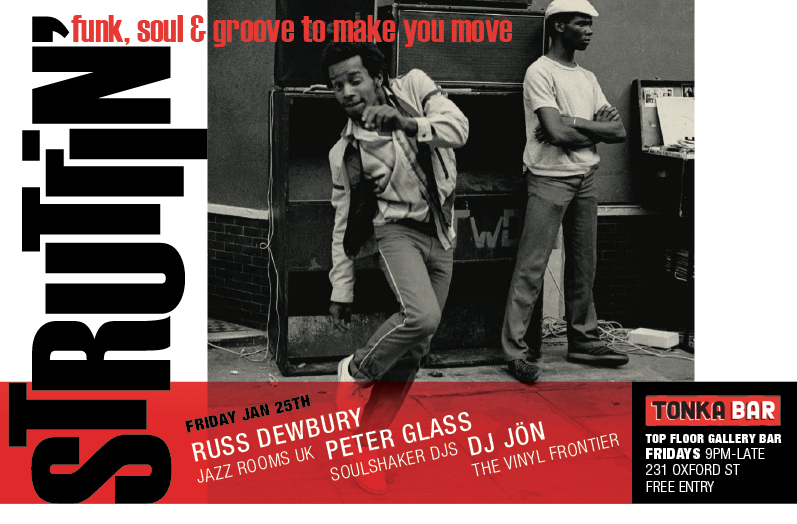 RUSS DEWBURY (Jazz Rooms, UK), PETER GLAS S (Soulshaker DJs),DJ JöN (The Vinyl Frontier) | SOUL OF SYDNEY FEEL-GOOD FUNK SOUL DISCO vibes & beyond. A top-shelf line up of selectors will be bringing the Funk to Tonka Bar on Friday 25th January, in the intimate top floor gallery bar. Come to dance and get down! Founder of the long running Jazz Rooms, Russ Dewbury has achieved a reputation as one of the funkiest DJs on the worldwide music circuit. Working with everyone from Art Blakey to The Roots, Mulatu Astatke to Fat Freddy’s Drop, Russ is also very well known for his legendary “Jazz Bop” live shows, Jazz Rooms Sunday Social Radio show and many Record compilations and productions. Mr. Glass fuses the best of soul, jazz, funk and rare grooves with a connoisseur’s ear and passion that has helped build a reputation as a Sydney authority Dee-Jay. He spearheaded Sydney’s rare groove and funk revival in the early 90’s that took it from the warehouse scene and returned it to the nightclub dance floors. Avid collector of funk, soul, boogie, latin, afro & rare groove, Jön hosts the Vinyl Frontier radio show on Eastside FM. I really like your wordpress design, exactly where would you download it through? Thank you, I’ve been searching for info about this topic for ages and yours is the best I’ve found so far.